New technologies offer one possible way to do so. They open new approaches in designing, producing and processing building construction and facades. Finding the one capable of having big impact is difficult – Additive Manufacturing is one possible answer. 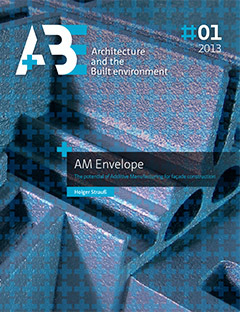 The term ‘AM Envelope’ (Additive Manufacturing Envelope) describes the transfer of this technology to the building envelope. Additive Fabrication is a building block that aids in developing the building envelope from a mere space enclosure to a dynamic building envelope. First beginnings of AM facade construction show up when dealing with relevant aspects like material consumption, mounting or part’s performance. From those starting points several parts of an existing post-and-beam façade system were optimized, aiming toward the implementation of AM into the production chain. Enhancements on all different levels of production were achieved: storing, producing, mounting and performance. AM offers the opportunity to manufacture facades ‘just in time’. It is no longer necessary to store or produce large numbers of parts in advance. Initial investment for tooling can be avoided, as design improvements can be realized within the dataset of the AM part. AM is based on ‘tool-less’ production, all parts can be further developed with every new generation. Producing tool-less also allows for new shapes and functional parts in small batch sizes – down to batch size one. The parts performance can be re-interpreted based on the demands within the system, not based on the limitations of conventional manufacturing. AM offers new ways of materializing the physical part around its function. It leads toward customized and enhanced performance. Advancements can for example be achieved in the semi-finished goods: more effective glueing of window frames can be supported by Snap-On fittings. Solving the most critical part of a free-form structure and allowing for a smart combination with the approved standards has a great potential, as well. Next to those product oriented approaches toward future envelopes, this thesis provides the basic knowledge about AM technologies and AM materials. The basic principle of AM opens a fascinating new world of engineering, no matter what applications can be found: to ‘design for function’ rather to ‘design for production’ turns our way of engineering of the last century upside down. A collection of AM applications therefore offers the outlook to our (built) future in combination with the acquired knowledge. AM will never replace established production processes but rather complement them where this seems practical. AM is not the proverbial Swiss-army knife that can resolve all of today’s façade issues! But it is a tool that might be able to close another link in the ‘file-to-factory chain’. AM allows us a better, more precise and safer realization of today’s predominantly free designs that are based on the algorithms of the available software. With such extraordinary building projects, the digital production of neuralgic system components will become reality in the near future – today, an AM Envelope is close at hand. Still, ‘printing’ entire buildings lies in the far future; for a long time human skill and craftsmanship will be needed on the construction site combined with high-tech tools to translate the designers’ visions into reality. AM Envelope is one possible result of this!